I had trouble with spelling in the 5th grade because all we had was a children's dictionary. One late school night, when I was practically in tears because I couldn't look up some words for a spelling test, my older sister Ofelia, drove me to the only open grocery store and bought me Funk & Wagnalls dictionary so that I can be prepared. I used that dictionary through high school, college and still have it today. Tonight, while my son was going through it to find some words that he missed on his spelling test, he found this buried in the pages. 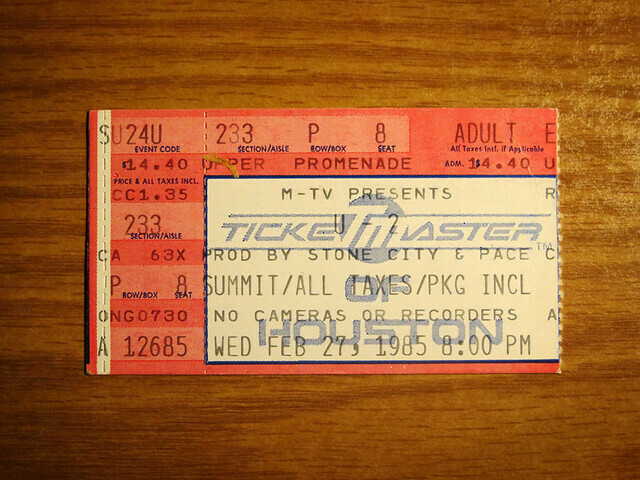 It's an old U2 concert ticket from their Unforgettable Fire tour. Take a close look at the year and the price. Yes, I saw that tour on the opening night here in Dallas, at Reunion Arena. We were up in the rafters. Didn't matter -- the sound and the band were huge. The price was small!